Milagros Boutique, owned and operated by Tony and Jennifer Fuentes, provides natural, fairly-made, and recycled products for families. The store, located in 5433 NE 30th Avenue, Portland, carries a wide range of high quality, ethically-made natural products for families and affordable, recycled items. Since opening its doors in 2004, Milagros Boutique has drawn socially and environmentally conscious parents to shop, learn and meet other like-minded parents.The Fuentes famiy serves the community not only through their product selections, but also by providing a community events center that draws parents and children for classes and playdates. Tony Fuentes talks about the Milagros Boutique story and the family business that stays true to its mission and values. We moved to Portland from Seattle to raise our family. My wife had gone to Concordia University, and she wanted to come back here. We moved close to Concordia to be in a neighborhood that is more diverse. Milagros Boutique owners Jennifer and Tony Fuentes with son Gael (left) and daughter Mila. Even before we got married, Jennifer and I have always talked about what kind of business we could have together. We have always envisioned doing something that is a reflection of our partnership in life. We didn’t originally intend to start the store; it’s just one of those things that kind of emerged. There was a small consignment store in the neighborhood that’s getting ready to close, and it hadn’t been open very long. At that time, we thought we could open a store for children that would also serve the community. We lived about a half mile away, so we decided to assume the space. This is our first business venture together. 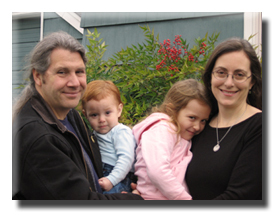 Jennifer has been a leader in La Leche League. She also has had experience working with people on attachment parenting issues. We wanted to promote natural parenting choices. My undergraduate degree was in music, so I played in a lot of bands, and operated a small record label in Boston. In Seattle, I started a guiding service so I used to do outings for rock climbing, kayaking and hiking. It was a lot of fun, but the work was very seasonal. In a lot of ways, the store reflects our ethics and choices as people. We approach everything in life as a personal experience, so the store reflects our personal values. The products we choose are fair trade and sweatshop-free. We have a lot of stuff that’s locally made. We also provide some recycled clothing options which are more affordable. All of our toys are wooden and made in the U.S.
We believe in building a strong relationship with our neighborhood and community. We have been involved in fund-raising for issues that affect our local community, but also national and international issues. Our concept for Milagros is pretty unique, and we believe that the market is large enough to accommodate other businesses. We have complementary relationship with a lot of stores, where they refer people to us, and in turn, we refer people to them. We don’t have formal strategic partnerships with these other stores, but we know what their values are and we know what they’re selling. We feel comfortable sending people their way, because I know that their families will be well-treated, and they’ll get what they’re looking for. Milagros means “miracles” in Spanish. Jen and I share Mexican roots. Family connections are very important to us. When immigrants from Central and South America, typically they bring the parenting gifts of the culture with them, including natural choices like breastfeeding. It’s not unusual for folks to respond to what they view as the dominant culture. Many view using cloth diapers and breastfeeding as things you do if you’re poor. The use of formula and disposable diapers is falsely adopted as a social status signal. More traditional choices that are ultimately more beneficial to the child are cast aside. Milagros Boutique attracts a wide variety of people from a wide variety of experiences and backgrounds. Some of our customers are adamant about making natural parenting choices, and we have customers who may prefer more mainstream choices, like disposable diapers. As a family, we’d really like to promote certain parenting choices, such as breastfeeding. We understand that there are cultural and social barriers to break through to get the message out to local communities of color, as well as people from different levels of income. We started doing events at the store very early on. We wanted to give people an opportunity to come here and check things out. As we expanded, we opened the events space next door to offer classes, presentations and host meetings for community groups. Every Friday morning, we host Mocha Moms, a support group for Moms of color. We’re also working with the Morrison Center to establish a play group here. Retail is an extremely hard business to be successful in. The profit margins are slim, and it takes a lot of energy to keep it going. For us, the ramp-up phase took four years. We have only begun to see a more realistic return on our investment. In the short time that we have been open, we’ve seen a lot of stores trade hands or close down. It isn’t easy – you really have to love what you’re doing to stay in retail. Luckily, we still love what we do. When we opened this location, we were one of the few businesses on this street. We really had to work hard to attract all our business. It required us to do outreach and connect with folks. To this day, a huge part of our success is positive word-of-mouth. The priority for us has always been our family. To this day, if the business become too unmanageable, or begins to pose a detriment to our connections as a family, we won’t hesitate to dump it. You don’t get time back. You can always money, but you can’t make time. With two children, balancing the needs of the family with that of the business is more challenging. Particularly when illness occurs; four people end up taking their turn being ill. We’ve always put our family first and business second. If it ever came down to making a decision to close the store – whether because of illness or another reason – we’re going to do that. We get approached a lot by folks wanting to start a business. The advice we always give is the importance of making sure that you’re not neglecting your family. If you have a partner in your life, it’s important that they are fully onboard with what’s going to happen. Owning a business is a 24-hour-a-day thing. With Jen and me, when we have a free moment when the kids are asleep, we talk about the business. It’s horrible (laughs). Even when we’re on vacation, invariably, we’re going to go to every baby store to check it out. The store has become an extension of our life. It’s important to us that our choices do not negatively affect our time as a family. If you have someone who is not supportive and sees the business as “your thing,” it will not work. Even if your partner is not running the business with you, they have to realize that they will be involved, and so must be committed to the business. It’s also important to be aware of the choices you make, ethically speaking. It is appalling how many products for kids are made by kids. I believe that many parents want to see the world a certain way, and have strong values they want to teach their children. All entrepreneurs must take their values very seriously. But I believe that parent entrepreneurs must be especially cognizant about how their choices as businesspeople are going to affect the future of our world. Join the Portland Metro Mocha Moms at Milagros at 11 a.m. every Friday for good conversation and good company. Mocha Momsis a support group for mothers of color. Anyone who supports the mission of Mocha Moms is welcome! The weekly support group meeting  also known as "chat and plays"  allows Moms to discuss important parenting (and personal) issues while the children play!